The “Fields to Restore” editor determines which fields for each record will be restored to Salesforce. By default all fields are selected. Be set to null for records inserted into Salesforce. Be left unchanged for updated records. Fields required for creating a new Salesforce record are marked as (required). If any required fields are not checked then only update restore operations are permitted. 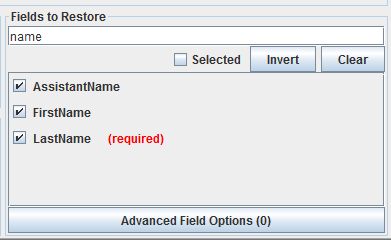 Selected If checked, only selected fields will be displayed. Invert When pressed, the field selection will be inverted. All selected fields will be deselected, and all non-selected fields will be selected. Clear When pressed, all selected fields will be deselected. 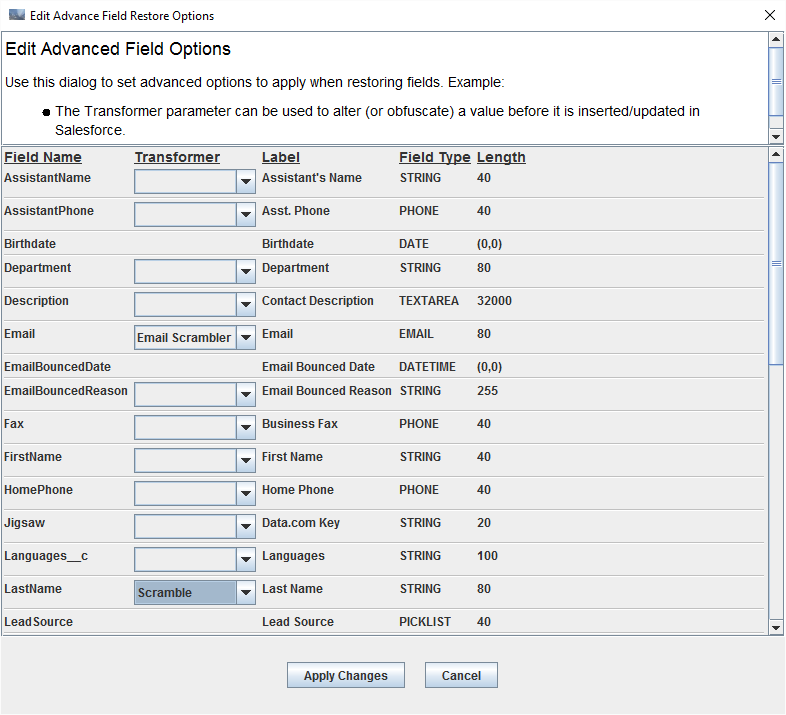 The “Advanced Field Options” button launches a dialog used to control how individual fields are restored. Randomizes email address fields before writing them to Salesforce. For example, the email “luck@casino.com” may become “AuFK@uuiLT.com”. Converts each letter or digit to a random character of the same class before writing the field to Salesforce. Converts a column to all **** before writing the field to Salesforce. For example, “Rebecca” will become “*******”. If the built-in Transformers do not perform the action you need, CopyStorm/Restore supports adding new Transformers. Contact support@capstorm.com if you want to learn how this is done. Other columns on this dialog provide read-only information about each column in the corresponding table.